The Grand Opening of Cornucopia II on Saturday was a great success ! 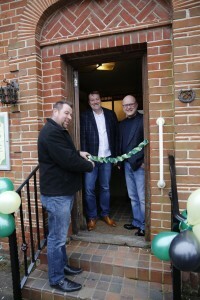 Owners David Charles and Glen Philpott were extremely pleased with the excellent turnout from both customers and traders, to the Grand Opening of their 2nd Antiques, Vintage & Collectables centre in Harleston, named Cornucopia II. 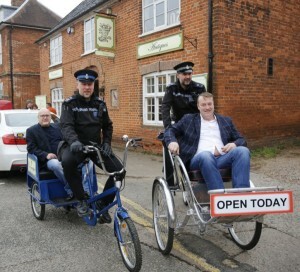 Two local Bobbys modelled the two vintage rickshaws, providing complimentary rides between centres and the Ribbon Cutting Ceremony by our builder & renovator Ivan Philpott, was followed with a gathering for bacon rolls and Buck’s Fizz. MP Richard Bacon was very impressed with the turn out and with the antique and vintage items for sale. We are both so pleased we have been able to breathe new life into another redundant building for the enjoyment of the town and equally pleased that the Cornucopia Brand is expanding.